Frequently Asked Questions | BounceGeeks.com Richmond, VA. Yes, set up and delivery are included, although additional fees may apply for areas farther out. Delivery is no extra charge if you are within 20 miles of our location. Our system will automatically calculate the distance and apply the delivery fee after you enter your address and proceed to check out. Remember prices do not include sales tax. Do you deliver to other cities/counties? What about apartments, can you set up there? Yes, we deliver to many areas, but once again please be aware that due to rising gas prices and the possible need for an extra truck and labor that travel fees can be quite high. Unfortunately, we can no longer deliver to apartments due to increased liability. 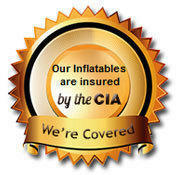 It is very important that we (and you) are completely covered by our insurance policy. Therefore, we ask that if you live in an apartment, please find another location for your party. We are happy to deliver to parks, all you need to do is contact your local government to reserve a spot in a nearby park. No. We arrive early to set up so you get the entire rental time to play. You are not limited to only 4 hours, however. You can enter a period of more than 4 hours for your event and the inflatable can be yours for as long as you want that day for only 20% more than the standard 4 hour price! What time do you deliver (and pick up) the rental items? It depends on how many rentals we have that day. Generally we arrive 1-3 hours before the rental time begins. If we have a lot of rentals that day, we may need to set up as early as 3-4 hours in advance. If this is the case, we will call the Friday before to confirm that someone will be at the party location. Pick up times vary as well and cannot be guaranteed. Please let us know if you require exact delivery or pickup times. Bounce Geeks will do it's best to accommodate all of our renters. Inflatables may be left overnight with customer if requested for an additional fee (depending on whether the unit is rented out the following day). We've rented some really dirty bouncers from other companies in the past. Are they always that dirty? No. The bounce house should be clean when you get it. Bounce Geeks cleans and disinfects after every rental. Yes, an electric blower keeps air in the unit the entire time. Once unplugged they deflate slowly. That's why we require an outlet within 100 feet of the unit or a generator. Longer cords can trip your circuit breaker so we bring our own heavy duty cords. We love setting up at parks but most parks do NOT have electricity. If you want to set up at a park, you must rent a generator. We rent generators at a reasonable cost. Also, parks are first come, first serve so get your spot early in the day. You are responsible for any necessary permits as well. Cash or Credit Cards from individuals, or checks accepted from a business, church, or other organization. If paying by cash, please have exact change as our drivers do not carry cash. What if we need to cancel for any reason other than bad weather? We understand that things come up and you may need to cancel. The good news is your deposit is fully refundable if you cancel your order at least 7 days prior to your rental date. This gives us time to make the item available again to rent to someone else. However, if you cancel between 2-6 days prior to your rental, we will keep the deposit and you will be given a rain check that is good for 1 year. So you don't lose anything, we just give you the ability to reschedule for a different date. If you cancel "at the last minute" either the day of your event or the day before, there will be no refund or rain check given. Yes, all orders require at least a $50 Credit Card deposit. The deposit is fully refundable if you cancel your order at least 7 days prior to your rental date. If you cancel between 2-6 days prior to your rental you will be given a rain check that is good for 1 year. We may waive the deposit at our discretion, you can give us a call to discuss if needed. How big are the bouncers, slides, etc? We have bouncers that are 13'x13' and 15'x15', which are standard sizes and will fit comfortably in most yards. Please note the space required for each item as some are VERY big and require extra space. When in doubt, measure your space to make sure it will fit. Jumps need room to be staked and they need room for the blower and can't rub against walls or trees as this may damage the jump. If you have stairs or a tiered backyard, please call our office to discuss options for setup. What about the bigger items? Any special requirements? Check the requirements listed with each jump. Also, make sure you have at least a 4 foot wide path to the area where it will be set up. The bigger ones, like slides and obstacle courses, can weigh up to 700 pounds so we need a clear path with ample room. We can set up on Grass (our favorite and best for the kids), dirt, asphalt, and concrete. Sorry, we can't set up on any type of rocks or mulch as the constant rubbing will wear through the vinyl jumps. What preparation of the area where the rental items will be set up are we responsible for? Please remove ALL debris from the area including: Pet Poop, trash and other items, furniture, hoses, sprinklers, lawn ornaments, large stones, etc. Please DO NOT mow the grass. What else am I as the renter responsible for? A responsible adult must be assigned to supervise the use of the rental items while they are in use. The renter is responsible for the safety of the users and care of the rental items. Should the inflatable be left with the renter overnight, the renter is responsible for unplugging the blower, detaching it from the inflatable, and securing it in a locked location. This is to prevent unauthorized use without the renter's knowledge. The renter is responsible for all damages and any cleaning charges due to misuse of the inflatable. No sharp objects, food, drinks, shoes, gum, silly string, sand or confetti is allowed inside the inflatable. Unfortunately, silly string and sand causes irreversible damage to any inflatable. 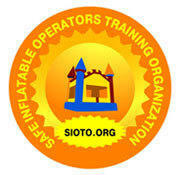 Are your inflatables and other rentals safe? Yes, as long as the safety guidelines are followed, including children being supervised by capable adults at all times. All Bounce Geeks inflatables are securely staked into the ground. 50lb. sandbags held inside vinyl covers are used for "non-stakable" surfaces such as asphalt, cement, etc. If we are done with the inflatable should we remove blower and/or cords before the driver arrives? NO, there are a few reasons for this. One, we have to clean the units after every use, so if you take it down we have to blow it back up. Two, if something were to break it would be your RESPONSIBILITY to replace it. However if you want to turn the blower off because you're done with it that is fine, just please DO NOT disconnect the blower from the unit or remove any of the stakes, sandbags or cords. The only exception is if you are keeping the unit overnight, then we require you to disconnect the blower and lock it away so no one uses it. Can you set up in poor weather conditions? Unfortunately, inflatables cannot be set up in temperatures below 40 degrees. We cannot set up our equipment in snow, high winds (above 15 mph), rainy or muddy conditions. If the weather report is not looking favorable, we will contact you to discuss the situation. If possible, we recommend looking for an indoor venue as a backup plan. What is Bounce Geeks LLC's weather cancellation policy? Should Bounce Geeks cancel the rental due to inclement weather (including rain, lightning, hail, and winds greater than 15 mph), you will either be given a rain check to reschedule your event, or a refund if you so choose. However, if conditions are not severe enough for Bounce Geeks to cancel, you are given the option to go ahead even though the weather may not be looking favorable. Once we arrive and set up, no refund will be given once we set up the inflatable. We make every effort to set up for each and every rental reservation. However, the safety of your children is our top priority. Bounce Geeks reserves the right to make the final decision to cancel a rental due to inclement weather. Unless a generator is used, the renter must provide an electrical outlet to power the blower(s) for the bouncer. It must be a GFCI grounded outlet on a 20 amp circuit. The blowers draw a lot power, so we can't have anything else being used on the circuit or it may trip the circuit breaker.